As a recent resident to Emporia, Joel Morrison is originally from Leawood, Kansas where his family currently resides. Before attending pharmacy school, he took some time off to discover his path in life, and spent a few years working at Disney World. At Disney, Joel had an opportunity to follow his passion of helping others, and the experiences he witnessed in Disney pushed him to pursue a degree in pharmacy. 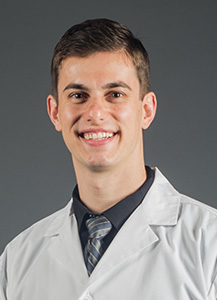 Joel graduated from the University of Kansas School of Pharmacy with his Doctor of Pharmacy degree in 2017. Joel enjoys being connected with his new community and takes time to volunteer as a dog walker, spends time not drinking coffee with his coffee buddies at the Emporia Airport, and is looking forward to the fun events Emporia has to offer. He is a graduate of the 30th class of Leadership Emporia and is now an ambassador to the Chamber of Commerce. Joel also enjoys spending time with his family and recent nephew.